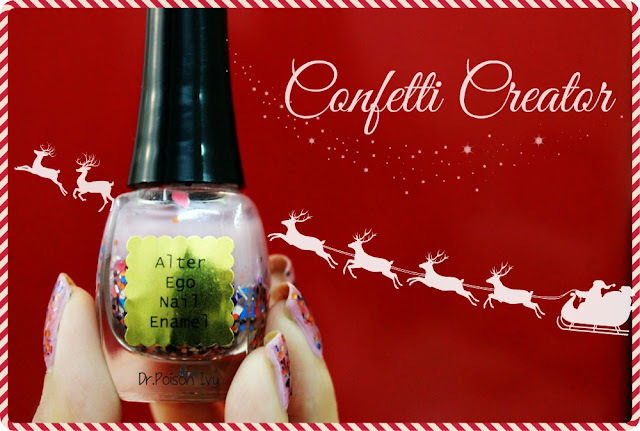 This indie glitter polish from Alter Ego Nail Enamel is just in time for my Christmas. I imagine confetti today is made by machines & uniformly shaped. Back in my day, it was hand cut from whatever was on hand & all different shapes, colors & sizes! That is what this enamel is...there are equal amounts of shredded matte dark red, pink & blue shreds, metallic silver & purple shreds, orange, gold & brown glitter & white string glitter. The polish has a matte finishing . You can add extra shine by topping it off with a top coat of your choice but i prefer the matte look so i leave it as it is. The suspension base has a very soft lavender shade but i figured it might be a little too sheer so i applied 2 coats of Lotus Nail polish and then layered 3 coats of the "Confetti Creator"
This is my second polish from ALter Ego Nail Enamel. Btw what are your Christmas Plans? this is lovely. love the effect on the nails. lovely! reminds me of birthday party confetti! OMG! Those are like the prettiest nails ever.